The Federal Ministry of Education is the organ of Government with the overall responsibility of laying down National Policies and guidelines for uniform standards, collect and collate data for the purpose of planning, financing and ensuring quality control at all levels of Education in Nigeria as enshrined in various statutory instruments, including the 1999 Constitution of the Federal Republic of Nigeria and the National Policy on Education amongst others. The mandate is derived from the National Minimum Standards Act No 16 of 1985 as amended by act No 9. of 1993 and in the 1999 Constitution, Chapter 2 Section 18. Become an economy model, delivering sound Education for public good. To use Education as a tool for steering development of all Nigerian citizens to their full potential in the promotion of a strong democratic, egalitarian, prosperous, indivisible and in-dissolvable sovereign nation under God. 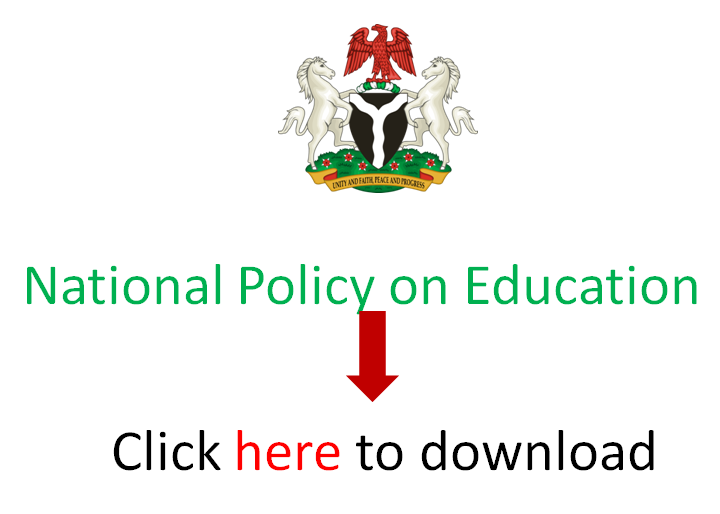 Formulating a National Policy on Education. Collecting and collating data for purposes of Educational planning and financing. Maintaining uniform standards of Education in the country. Controlling the quality of Education in the country through the supervisory role of the Inspectorate Services Department, National University Commission, Nigerian Commission for Colleges of Education and Nigerian Board for Technical Education within the Ministry. Harmonizing Educational policies and procedures of all the states of the Federation through the instrumentality of the National Council on Education. Effecting Co-operation and Coordination of Educational matters at National and International scale. Developing Curricular and syllabi at the National level in conjunction with NERDC bodies. The Ministry also ensures Co-operation and Coordination on Educational matters at National and International levels. The Ministry, in addition has the responsibility of seeing to it that Nigerians effectively participate in and benefit from the vast knowledge available globally; especially in the on-going Information and Communication Technology (ICT) Revolution. The Federal Ministry of Education in the bid to decentralise its services so as to bring them closer to our customers has various Departments, Units and parastatals where effective service delivery can be accessed. Read about the Departments and Units here and the parastatals here.